Kazuri, which means “small and beautiful” in Swahili, began in 1975 as a tiny workshop experimenting in hand crafting ceramic beads. Its founder started with two single mothers and soon discovered that there were many others in the villages around Nairobi, most of who were disadvantaged and were in great need of regular employment. 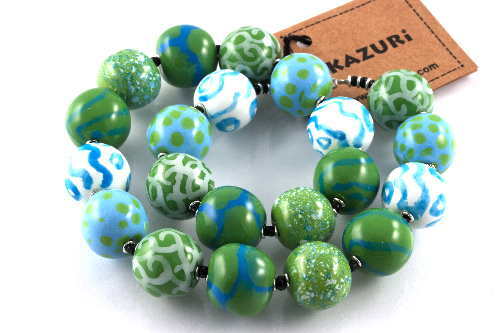 Today Kazuri has grown tremendously and now has a large workforce of over 340 women skilled in the crafting of ceramic beads, strung into beautifully and artistically into jewelry. This flair has taken us to a different dimension of making our own unique range of pottery which reflects the culture and wildlife of Kenya. Each piece, like our beads, is handmade and hand painted in rich colors. Our Mission is to provide and sustain employment opportunities for disadvantaged members of the Kenyan society, especially Single Motherhood women and in order to achieve this, we must produce top quality Ceramic Jewelry and Pottery. This will also ensure that we are well equipped to compete and be recognized in both the local and international market. Our Vision is to be recognized in both the local and International market as a top Brand of Hand crafted ceramic producer. Our Brand is well established worldwide as we export over 70% through a network of distributors all over the world.